FOR SALE BLACK PELI 1510 CASE WITH FOAM. • Maximum authorised cabin luggage, YOU MUST CHECK WITH EACH AIRLINE BECAUSE THEY CAN DIFFER. • Pick 'N' Pluck™ with convoluted lid foam. Weight with foam 5.95kg. Watertight, dustproof, chemical resistant and corrosion proof. This Peli 1510 is again unbreakable. Protective Cases are specialist suppliers in the whole range of Peli Cases and Peli Torches. ITEM FOR SALE: 1510 PELI CASE WITH PADDED DIVIDERS IN THE BASE AND PHOTO LID ORGANISER. • Pelican ™ / Peli ™ case compatible and fits any wheeled hardcase. Protective Cases are specialist suppliers in the whole range of Peli Cases and Peli Torches. peli 1510 case type pick and pluck foam . Condition is New. The TrekPak insert allows you to optimize space while maximizing protection. Get the best protection possible inside your Peli™ 1510 case with the TrekPak custom insert. Save valuable storage space while organizing and protecting the gear in your Peli™ 1510 Case with the Customizable Modular Insert Kit from TrekPak. Peli Accessories. 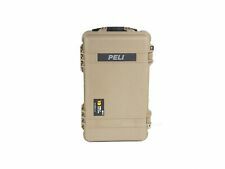 for Pelican Peli 1510 1560 Hard Case only. Roller skates wheels to fit Pelican 1510 and 1560 case only. If you have any other case do not buy it. Ready to Swap - No Modification Needed. 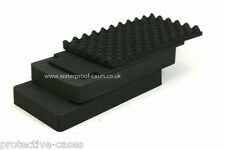 ITEM FOR SALE: 1510 PELI CASE Colour Black with Lid 1 x 10mm layer of base Foam only (solid base foam not pre cubed ). Protective Cases are specialist suppliers in the whole range of Peli Cases and Peli Torches. Peli 1510 Case No Foam : colour Desert Tan. ITEM FOR SALE: 1510 PELI CASE EMPTY, NO FOAM. Protective Cases are specialist suppliers in the whole range of Peli Cases and Peli Torches. Unbreakable, watertight, rustproof, chemical resistant and corrosion proof. Unbreakable, watertight, dustproof, chemical resistant and corrosion proof. Protective Cases are specialist suppliers in the whole range of Peli Cases and Peli Torches. COLOURS AVAILABLE: PINK. 514 289 193 46 147 559 351 229. This Peli 1510 SC Studio Case is again unbreakable, watertight, dustproof, chemical resistant and corrosion proof. Protective Cases are specialist suppliers in the whole range of Peli Cases and Peli Torches. The TrekPak insert allows you to optimize space while maximizing protection. This Peli™ 1510 is again unbreakable, watertight, dustproof, chemical resistant and corrosion proof. Save valuable storage space while organizing and protecting the gear in your Peli™ 1510 Case with the Customizable Modular Insert Kit from TrekPak. ITEM FOR SALE: 1510 PELI CASE WITH FOAM SET. Protective Cases are specialist suppliers in the whole range of Peli Cases and Peli Torches. Unbreakable, watertight, rustproof, chemical resistant and corrosion proof. Unbreakable, watertight, dustproof, chemical resistant and corrosion proof. ITEM FOR SALE: 1510 PELI CASE WITH FOAM SET IN PINK. Protective Cases are specialist suppliers in the whole range of Peli Cases and Peli Torches. PELI 1510 Studio Case In PINK ( Dividers and Lid Insert will be BLACK ). This Peli 1510 SC Studio Case is again unbreakable, watertight, dustproof, chemical resistant and corrosion proof. Protective Cases are specialist suppliers in the whole range of Peli Cases and Peli Torches. Watertight, dustproof, chemical resistant and corrosion proof. This Peli 1510 is again unbreakable. Peli 1510 LFC Case. LFC Version: The base section of the case has 1 layer of pick n pluck foam and 1 layer base foam. PELI 1510 LOC Laptop Overnight Case In PINK insert will be BLACK. The Peli 1510 LOC Laptop Overnight Case has 2 in 1 protection: detachable computer sleeve and accessories pouch. Protective Cases are specialist suppliers in the whole range of Peli Cases and Peli Torches. Ending Soon. you can buy in set of 6 max. we do not take any responsibilty after this. Desktop PC. PC Components. Monitor & TV. Why Choose Us! An indestructible, watertight and airtight case constructed from lightweight, structural resin, with a neoprene O-ring seal and exclusive purge valve. Case Colour: Black. Strong polyurethane wheels with stainless steel bearings. Protective Cases are specialist suppliers in the whole range of Peli Cases and Peli Torches. 514 289 193 46 147 559 351 229. 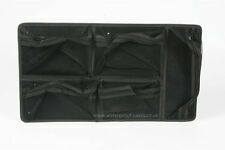 The dividers are made from ballistic nylon and are padded and flexible. Peli Padded dividers for the Peli 1510. Protective Cases are specialist suppliers in the whole range of Peli Cases and Peli Torches. =8 FITS INSIDE PELI 1510 Case. 8 fit in a Peli 1510 hard case. Kata DL-H-531-G Features. now discontinued (Kata has been bought by manfrotto). Fit insiudePeli 1510 case. Inner horizontal divider (or for extra base padding). 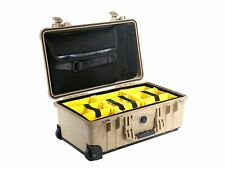 Peli Case Lid Organiser suitable for the iM2400/2450 range of cases. Both models are comfortable with extractable handle, ergonomically sound carrying handles and strong rollers. Particularly durable in the typical Peli materials. The boxes are sealed (as normal) and can be fitted with a suitable foam insert. Peli 1510 Case without foam black (waterproof, dustproof, crushproof). The 1510 is arguably the most famous Peli Protector case. It's certainly the most popular. Sized to qualify as carry-on luggage with most airlines the 1510 features wheels and a retractable handle, making it a popular choice for individuals that often travel with expensive equipment, such as photographers. Easy open double throw latches. Open cell core with solid wall design - strong, light weight. Peli 1510 Case without foam black (waterproof, dustproof, crushproof). The 1510 is arguably the most famous Peli Protector case. It's certainly the most popular. Peli 1510 without Foam, Black. Airline carry on size with automatic pressure equalisation valve. Watertight, dustproof, chemical resistant and corrosion proof. This Peli 1510 is again unbreakable. Protective Cases are specialist suppliers in the whole range of Peli Cases and Peli Torches. ITEM FOR SALE: 1510 PELI CASE WITH PADDED DIVIDERS IN THE BASE AND FOAM IN THE LID. ITEM FOR SALE: 1510 PELI CASE EMPTY, NO FOAM. Protective Cases are specialist suppliers in the whole range of Peli Cases and Peli Torches. Unbreakable, watertight, rustproof, chemical resistant and corrosion proof. Protective Cases are specialist suppliers in the whole range of Peli Cases and Peli Torches. ITEM FOR SALE: 1510 PELI CASE WITH FOAM SET. WEIGHT W/O FOAM:16.3 lbs (7.39 kg). Water Resistant, crushproof and dust resistant construction. Protective Cases are specialist suppliers in the whole range of Peli Cases and Peli Torches. made with love by. 514 289 193 46 147 559 351 229. The 1510 is arguably the most famous Peli Protector case. It's certainly the most popular. Box Contains Peli 1510 without Foam, Black. We make buying online as simple as it can be. Why buy from us?. Peli 1510 with Foam, Black . Available in black. FAA maximum carry on size. Retractable extension handle. Two strong polyurethane wheels with stainless steel bearings. Easy open Double Throw latches. Open cell core with solid wall design - strong, light weight. Peli 1510 Black. Product colour Black. Network & Comms. Print & Scan. 27L, 558x350x228mm, 6.17kg, Black. It speeds things up if you can write your RMA number clearly on the outside of your parcel. They may be able to solve the problem straightaway, and if not will advise you further. The Peli 1510 is a rugged and versatile protector case that is small enough to qualify as hand luggage on most airlines, yet large enough to house all essential photography equipment. The Peli 1510 has an immersion protection rating of IP76 and eBay offers a wide range of options to suit all budgets. What makes the Peli 1510 such a popular choice for professionals? The Peli 1510 Protector is manufactured from extremely strong Copolymer Polypropylene using a solid wall construction. 1510 cases are vertically stackable and feature a neoprene rubber lid seal, retractable handle, and built-in wheels. An automatic valve allows pressure equalisation during flight, to protect the case and its contents against atmospheric pressure changes. 1510 protector cases are available in a range of colours, including black, silver, yellow, pink, and desert tan. How resilient are Peli 1510 cases? The 1510 case has undergone extensive testing, and either meets or exceeds the requirements embraced by NATO for impact resistance, extreme temperature endurance, and resilience against vibration. As such, the 1510 cases are Stanag 4280/Defstan 81-41 certified for military use. What insert and divider options are available for the Peli 1510? The Trekpack divider system consists of a foam lid insert, a foam bottom insert, two perimeter segments, and three divider segments. The dividers can be cut to the required length using the cutting tool provided. 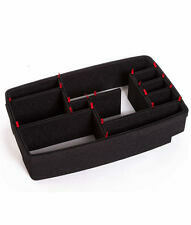 This pack allows you to segment the case into a grid-style layout that is customised to fit your equipment. The Padded 1510 divider insert allows you to segment your case in a reconfigurable layout. Individual padded inserts are held in place by strong Velcro strips, allowing the layout to be quickly reconfigured to fit different equipment as needed. Peli 1510 lid organisers attach to the inside of your Peli 1510 lid allowing you to store small items such as SSD cards and cables in the zippable mesh pockets. The 1510 full foam insert set includes bottom foam, lid foam, and two layers of Pick ‘n’ Pluck foam. Pick ‘n’ Pluck foam is pre-cut in a manner that allows individual cubes of foam to be removed, this allows you to create a separate recess for each piece of equipment. Content provided for informational purposes only. eBay is not affiliated with or endorsed by Pelican Products Inc.